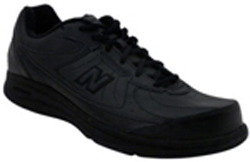 The New Balance 577 walking shoe, for men and women, is a great walking shoe for moderate pace walkers and for those who work on their feet all day like a health care provider. The 577 is built for comfort, helps fight foot fatigue and discourages joint pain. These walking shoes come in black or white and lace-up shoelaces or Velcro straps for a customizable look and fit. The upper is made of a premium leather for comfort, durability and breathability. The Walking Strike Path stabilizes your foot with each step you take. Abzorb cushioning in the midfoot provides excellent shock absorption and provides added cushioning. They are Medicare/HCPCS Code A5500 Diabetic shoes. 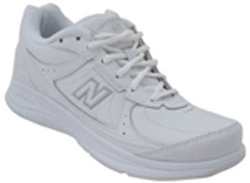 You won't find a more comfortable walking shoe than the New Balance 577. Get fitted at a Rogan's Shoes location near you or find your pair online at RogansShoes.com.